/ Disposable Straight Razors – Do They Work? Disposable Straight Razors – Do They Work? Straight razors are becoming a popular form of shaving again, which could be why people are talking about them more often. Some are also concerned about disposable straight razors because they don’t know what they are or how they work. The truth is they are razors that are designed to look just like straight razors, except they have a blade that can be removed and replaced. This is an interesting concept and something that makes them easier to use. If you want to know all about disposable straight razors, keep reading. As mentioned previously, disposable straight razors, which are often called shavettes, are razors that are designed to look and work like straight razors, but have a disposable blades. It is thought that they were developed for barber shops and places like that, in order to be more hygienic and save time. In other words, if you were to get a shave at the barber shop, you’d know that you weren’t being shaved with something that had just been used on someone else. There are a few advantages to having a straight razor with disposable blades. Costs less. The overall cost for one of these razors is much less than you would pay for a regular straight razor. At the same time, this one may not last as long, depending on the mechanics of it and if it’s well made or not. Can throw away blades. Being able to throw away the blades is a huge help when something is dull, since you can just swap them out. It is also great in the event that you haven’t used your razor in a while and want to make sure you are shaving with something clean. Don’t need to get strop or sharpen blades. The thing that really sets this razor apart is that you don’t have to sharpen the blade or get a strop. That means you don’t have to learn how to use a strop, or any special creams or stones to carve blades the proper way. There are also a few disadvantages to straight razors with disposable blades. Have to find the right blade. Some razors will come with extra blades so that you will have some to use. However, after those are used, you still have to find replacement ones that will fit. If you don’t like the ones that came with your razor, that can be a real problem. Otherwise, you can just order the same type that came with the product, or look for them in stores. More dangerous to use. 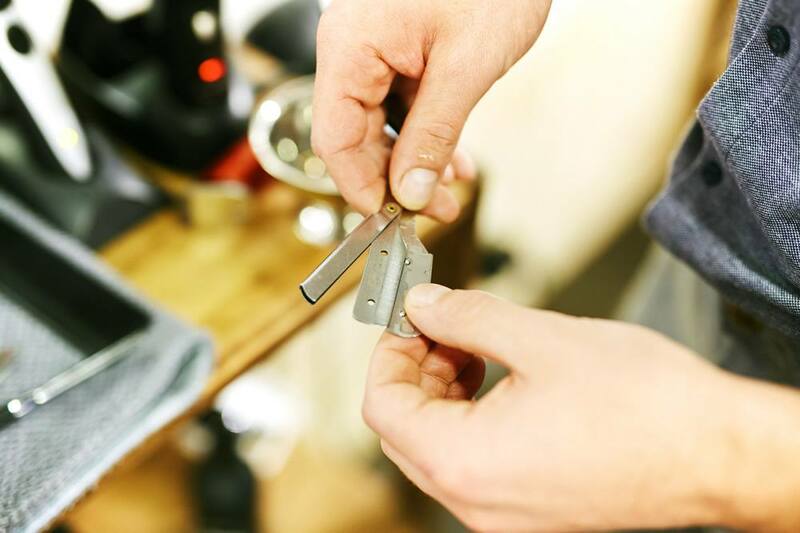 In the case of regular straight razors, they are relatively safe to use after you learn the process. This is due to the fact that the blade has some give to it and is able to sit how you need it to sit on your face to shave it properly. With disposables, the razors are stiffer, so they don’t have a lot of give when you’re shaving. Less control. Since the blades are smaller and made of a different material than the razor, you have less control over what you are shaving. You will have to learn how to use this variety effectively. If you’re still wondering whether disposable straight razors work or not, they absolutely do. Unfortunately, they don’t work the same as straight razors do. For instance, if you know how to use a straight razor, that doesn’t mean you can start using disposable straight razors right away, because it is a totally different process. This is due to the fact that they are rigid and unable to accomplish the same shave as a straight razor. They do work rather well and give you a great shave. They are also great for people that want to make sure they are making responsible choices, since you don’t have to clean this one in the same way to keep it hygienic. Straight razors are very different from disposable straight razors, even though their name would imply that they work the same. Between not having to buy a strop and not having to learn how to sharpen a blade, you may think you’re set. However, disposables aren’t a replacement for straight razors. The disposable razors must be changed out often and you have to be more careful when shaving because they can be more dangerous. In essence, it is simply a matter of preference. You will have to learn how to use it, but it isn’t as hard to care for. You can change the blades and keep it clean, and you don’t have to worry about other aspects of having a straight edge razor. They are also less expensive and can still last a long time.